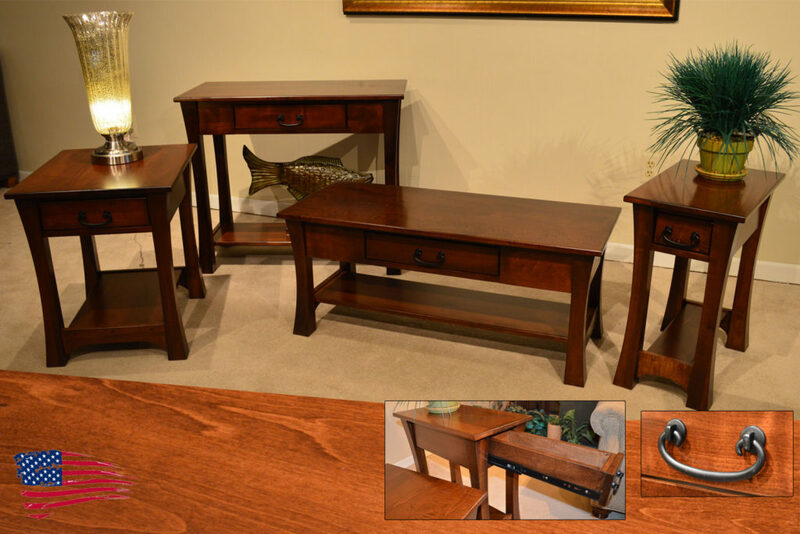 Amish Woodbury Tables feature curved bell shaped leg style and all solid brown maple construction, dovetailed drawers, and full extension glides for lifetime enjoyment. These heirloom quality tables can be ordered in any size, wood specie, stain, and hardwares of your choice. Made in USA! Tables feature catalyzed finish for an exceptional lifetime durability, plethora of style, finish colors, two tone options available, custom sizes, custom shapes, and wood specie options in solid (oak, maple, cherry, rustic cherry, tiger oak (quarter sawn white oak), rustic tiger oak, tiger maple, walnut, grey elm, hickory, hard maple).